NCSCC: Tell me a little bit about this history, this list that you brought. I’d love to hear some about that. John Konze: Well I thought you just might be interested to see that we’ve actually only had a post office there since 1857, and that’s basically around the time just around the gold rush. And at that time I think there was 10,000 people in the North San Juan area and they first got the post office setup there. I’ve read a couple places where the town was first named San Juan by a veteran of the Mexican-American War. But they changed it to North San Juan because of the town of San Juan in San Bonito County, so the name was changed to North San Juan when they got the post office to keep them separate. That was back in 1857. But there’s really not a lot of postmasters since that time, and you can see most of them spent a fair amount of time in office. Most of them were eight to ten years. So it’s a nice list to have. One of them, Douglas Buckbee served as Postmaster 33 years, his daughters still live in the same house where they were born in town. 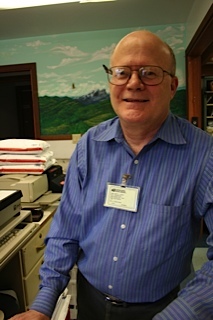 The post office was in three locations in town and Doug served in all three of those locations. It used to be across the street, you know where the pizza parlor is now, on that opposite corner? NCSCC: There used to be a big building. John Konze: There used to be a building on that corner, then the other house next to it. The post office was located there. Then it moved across the street where Darlene’s store is now at the nursery. We were at that building for a few years, then John Whittler and Bob Eiermann and Larry Contreras built the building we’re in now. So it’s been there since oh… I think the late 1970’s. NCSCC: And they built it exclusively for the post office? John Konze: I don’t think so initially. Initially there was a house there that had burned down and they bought the property and they were going to build another house there. I think it ended up being a more viable commercial situation and they got together with the post office because the post office was growing at that time. It’s a really nice location for the post office. It’s setup well for the delivery on the street and for our mail to come up from Sacramento. Can’t miss us. NCSCC: I was going to ask about the history. Do you know if at any point – when hydraulic mining was stopped and there was a huge exodus of folks from the Ridge – that the post office was threatened? John Konze: Not that I know of. It’s never ceased operating since that time. NCSCC: Any stories of heroic mail service, post service in this history? Are there stories that you’ve learned or you can tell us? John Konze: Well, one thing that I remember that Doug Buckbee’s daughters have related to me was that in the 1960’s during holidays he and his girls would make sure that all the packages got delivered at Christmas time. They would even drive them out to all different areas of town, town meaning North San Juan area, and they would deliver everything that hadn’t got delivered at the office. They wouldn’t have their Christmas at home until all those packages were delivered to all the customers. I believe that is heartwarming story. The other folks, I don’t really have that much information on them. I’ve known some of the later Postmasters but one of the most unsung heroes in the North San Juan post office is my carrier. And any contract carrier that’s delivered out of that office, because we travel from my office in North San Juan to Alleghany every day. And that can mean mushing through the snow and at times not being able to get all the way to Alleghany. Then we also deliver down in the township of Forest, outside of Alleghany, and oftentimes we can’t even get down in there. So that’s the real hero one for if you want harrowing stories. She goes up in all that weather. It can be sunny in North San Juan and it can be snowing two or three feet in Alleghany when she gets there, all the way up the Ridge. That happens every she is on the road. NCSCC: Last year (2011-12) must’ve been really crazy. John Konze: She had some really rough times. There was a couple of times that we weren’t able to get all the way to Alleghany, and one time, she was very late returning I decided to jump in my truck to go out and find her to make sure she was okay and we were in whiteout conditions to make sure the mail came through rain, sleet or snow as they say. We do our best to provide service and try to do it safely, to make sure we’re not endangering ourselves or the mail.